With the United Synagogue mission of 'Living, Learning and Caring', US Chesed represents the 'Caring' side of the work of the organisation. The US Chesed Department is part of the Community Services Division. It works closely with the Living and Learning department and with Tribe. We are told by Shimon the Righteous in Pirkei Avot Chapter 1 verse 2: "The world stands on three things: Torah (Jewish learning) Avodah (service of God) and acts of Chesed (loving kindness)"
Acts of loving kindness (chesed), taught the Sages, are greater even than tzedakah. Tzedakah can be done only towards the poor; but loving kindness can be directed towards the rich and poor alike. Tzedakah is done with money; chesed with time or money. Tzedakah is only for the living; chesed can be shown to the living or the dead. Our aim is to help both our own members and the wider community in which we live. US Chesed has a range of initiatives and projects to engage our members in practical chesed activities, making a tangible difference to other people's lives. 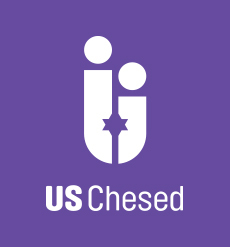 US Chesed incorporates US Community Cares, Project Chesed, the US Chesed Bursary Fund, Jewish Hospital Visitation and Jewish Prison Chaplaincy. We are always delighted to hear from communities and individuals who would like to be involved with our projects. If you would like more information, would like to volunteer, or discuss running your own chesed initiative, please be in touch. At the very beginning it was God who created light, but in the end, it is the light we create in every act of goodness that we do that will make all the difference.